Tomorrow, June 21, 2016, Walt Disney World will be releasing rates and package info for 2017. If you have been waiting to book your 2017 Disney vacation, tomorrow is the first date you can book. Each year, Disney makes small changes to their dining plans and packages, so you really can’t assume next year will be the same as this year. If you look at the dining plans when they were first released years ago, a ton has changed (we now get less for more money). Of course, 2017 is going to be no different. 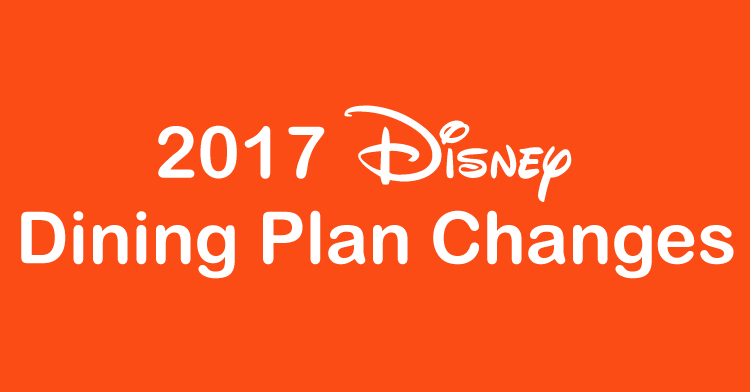 While not yet officially released, we have obtained copies of the 2017 Disney Dining Plan brochures (linked below for you), and there are some changes coming for 2017. Please note, pricing will not be released until tomorrow. Quick-Service meals no longer include a dessert. All quick-service meals at Walt Disney World will now include only a non-alcoholic drink and an entree. This holds true whether you are using the quick-service, Disney Dining Plan or the Deluxe Disney Dining Plan. In place of the missing dessert, the Quick-Service and Disney Dining Plans will now include one additional snack. Most quick-service restaurants offer their desserts as a snack option, so you can still opt to get dessert by using one of your snack credits. This change is a positive though, as many quick-service restaurants offer sub-par desserts, and this will allow guests greater flexibility when dining. Plus, I would much rather choose from an entire park’s options for my snack than be forced to order a dessert I know I will not eat (I am looking at you Restaurantosaurus cheesecake in a cup). For the Quick-Service Dining Plan, this ends up being a slight negative, as you are trading two desserts for one additional snack, but hopefully this will keep the price increase down. The Premium and Platinum plans, which are rarely sold will be discontinued for 2017. Despite many rumors to the contrary, most Walt Disney World character meals ARE NOT changing to 2 table service credits per person. The only character meal currently listed as 2 credits per person is Fairytale Dining at Cinderella’s Royal Table. It appears as no additional restaurants have been reclassified as signature restaurants, so no changes in that regard from this year. Please Note: While looking at the current 2017 Disney Dining Plan brochures, please understand that the restaurant list is incomplete. Every year, Disney must negotiate with Disney restaurants to be included on the Disney Dining Plans, and that negotiation is usually not completely until much later in the year. So, many Epcot and Disney Springs restaurants are not going to be listed on the current version of the brochures, but that DOES NOT mean they are not included, but that they will be included in the plan at some point before the end of this year. When planning, assume the list of restaurants for 2017 will look very much like the list for 2016, and you will be in good shape. What do you think of the changes to the Quick-Service restaurant?